I frequently use the HydroSHEDS dataset from the USGS for projects requiring a DEM outside of the United States. HydroSHEDS is a contrived acronym for Hydrological data and maps based on SHuttle Elevation Derivatives at multiple Scales, meaning the digital elevation model comes from the Shuttle Radar Topography Mission (SRTM). SRTM mounted an InSAR array on Space Shuttle Endeavour during STS-99 in 2000 to collect elevation data from latitudes 56°S to 60°N. Although SRTM has less global coverage and less spatial resolution than the ASTER GDEM, SRTM has better vertical accuracy, making it more attractive for hydrologic applications like HydroSHEDS. Each tile in this map is labeled with the concatenated tile name representing the coordinates of the lower-left corner of each tile. 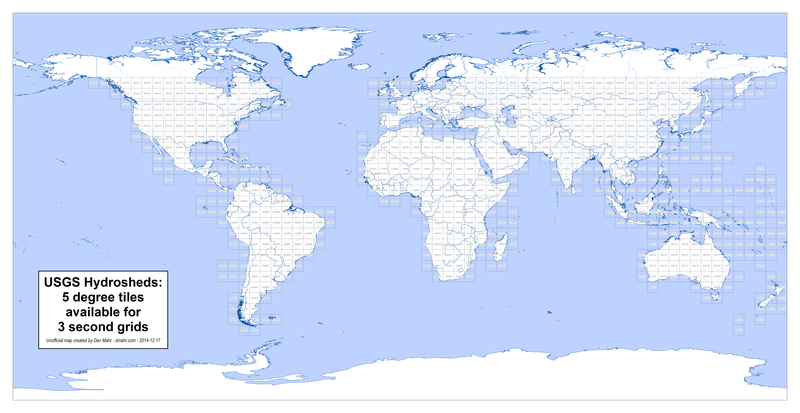 For example, the tile for Rhode Island is “n40w075” with a lower left corner at 40°N latitude and 75°W longitude. The fact that the tiles are measured in degrees means that this is an excellent case for using the plate carrée equirectangular projection, which has horizontal and vertical units of degrees. This is, of course, equivalent to what ArcMap shows when setting a data frame’s coordinate system to a “geographic” projection. For convenience, you can also download the index in shapefile or GeoJSON format.